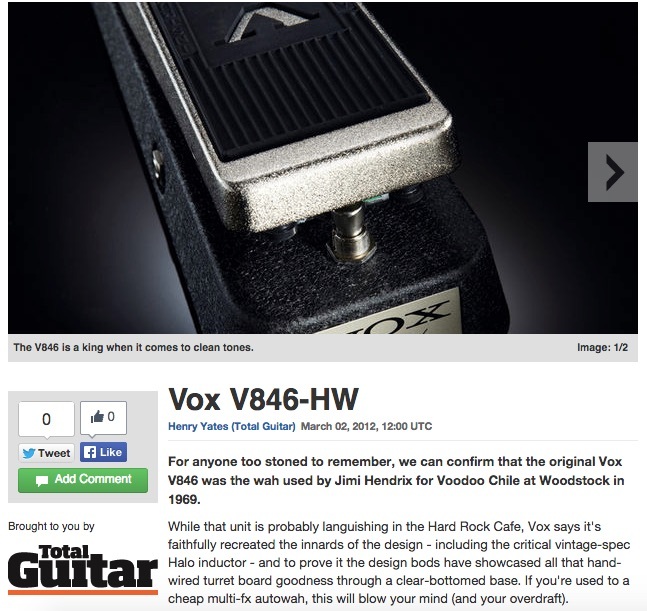 *Music Radar* [confirms](http://www.musicradar.com/us/reviews/guitars/vox-v846-hw-532298) Jimi's use of this pedal by saying "For anyone too stoned to remember, we can confirm that the original Vox V846 was the wah used by Jimi Hendrix for Voodoo Chile at Woodstock in 1969." At 2:26 you can see it on his board live. It's possible this is another vox version, but the V846 is pretty common to players and the other models barely get around. hide used this amplifier head on several recordings and live concerts. Shown in the rig rundown of Leda's gear during his time in Deluhi, the pedalboard showed that he used ExPro switching system and wireless system, as well as a Korg tuner, ProCo Rat Distortion and a Vox V846 Wah. Pedalboard is shown from 2:10, where Leda begins to explain his signal chain. This wah sounded less throaty and grungy than my 847. Treadle action was better and the pot didn't crackle. More like a crybaby but with a little more mid-oomph. I am not sure why sold or traded this. I probably hadn't plugged it in for some time and since wahs are HUGE I decided to clear some drawer space for effects I would use more frequently. Maybe I swapped it for a microphone or a compressor, who knows? Good Wah Wah for the low price. It's a good Wah Wah, vintage tone and look, I would like to gave it 5 stars but the reason that i gave it 4 its because you probably have to change the potentiometer because it's ridiculously noisy! Construction: 5 Stars. Tone: 4 Stars. Quality: 3 Stars. nice classic wah sound from the 70's. This is the original one without a power supply so it's pretty good. Nice build and feels durable as heck. This thing also sounds killer with some distortion.